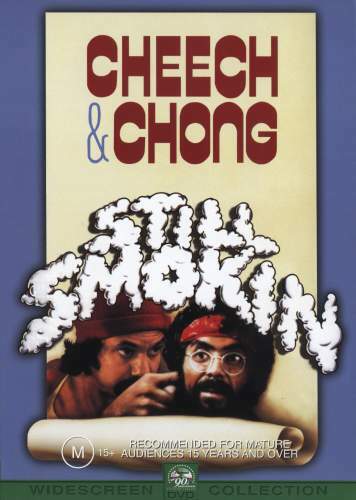 Still Smokin’ is my first experience with the infamous comedy duo Cheech and Chong. Both guys have impressed me as actors in the limited roles I’ve seen them in (Cheech Marin as Hurley’s dad on Lost and Tommy Chong as the drugged-out hippie on That ’70s Show) but I’d never seen them in action together in any form. Still Smokin’ obviously isn’t their first film. Cheech and Chong had already created a formidable comedy franchise with their first four films, helping establish a new genre (stoner comedy) along the way. The guys were already running out of steam a little bit by the time Still Smokin’ was released, which is probably why they decided to shake up their formula a bit. Unlike the four films before it, Still Smokin’ is less about creating its own story and wacky situations and more about finding a thing framework for what is essentially a concert film. That thin premise is that Cheech and Chong are invited to Amsterdam for a Burt Reynolds and Dolly Parton film festival. Outside of Cheech being mistaken by all the Dutch as Burt Reynolds because of his mustache, there aren’t many laughs early in the movie. It plays like a bad B-movie with a few subpar filmed sketches thrown in disguised as dream sequences. What strikes me about some of the sketches is how far these prominent comedians were allowed to go in 1983…frankly, they touch on some areas that would get 99% of comedians in major trouble today. In one scene, Tommy Chong appears in full blackface as a blues character named Blind Melon Chitlin. Another scene called “Queer Wars” features both men playing outrageously gay drag queens. Both scenes feel incredibly dated today, probably only because no paid entertainer would even attempt them. I was beginning to get exasperated right around the time the two men take the stage in an effort to save the film festival or something like that. What follows is actual footage of a Cheech and Chong standup show in Amsterdam. I say this without having seen any of their earlier, more successful movies but I find these guys to be really brilliant live sketch performers. Their energy and their commitment to a character or a premise is infectious to watch. The perfect example would be a sketch called “Ralph and Herbie” in which both men enter the stage on all fours portraying two dogs who are best friends. I’ve got a little bit of a bias against most stoner comedy because I think a lot of it is based on trying to make the stoner look cool. It’s typically all about how the stoners are really the ones who have it all figured out and the straight tightwads just need to chill out. Cheech and Chong might be stoner comedians by reputation but their stage presence is anything but laid back. They aren’t afraid to give every sketch their all and they aren’t afraid to be physical and tense. I don’t know that I can completely recommend this movie to anyone back in 2009 because the fact remains that as a movie, it stinks. The non-standup material in the film is almost unbearably dumb and hard to sit through. But if you’re into watching great standup comedians in action, this is worth devoting some time to. The final half-hour is an opportunity to see two of the best of their time at work.